With Halloween almost upon us, you’d be crazy to not to make the most of your gory Pumpkin insides! 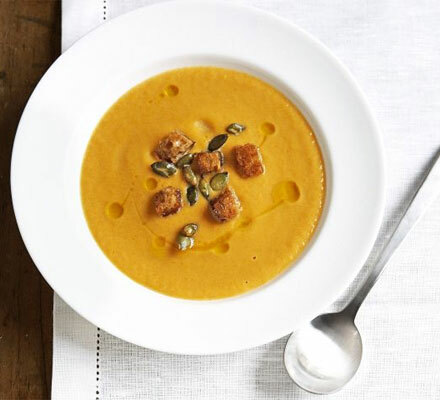 Try making this delicious Pumpkin Soup, perfect for warming little trick or treaters! Heat 2 tbsp olive oil in a large saucepan, then gently cook 2 finely chopped onions for 5 mins until soft but not coloured. Add 1kg peeled, deseeded and chopped pumpkin or squash and 2 teaspoons of crushed cumin seeds to the pan, then carry on cooking for 8-10 mins, stirring occasionally until it starts to soften and turn golden.